5.0 operating system on a crisp, bright, color touch screen display. 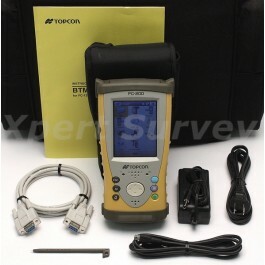 Watch your field data come alive with Topcon’s FC-200. remains open for expanded memory. The FC-200 can mount an RS-1 robotic radio on the back of the unit. Dimensions 7.72 in. x 4.21 in. x 2.40 in.